Trying out Google for Work, whether that be Google Apps or Drive for Work (our preference), is the best way to really see if the Google platform will satisfy your business needs. You have 30 days to test the Work version of the product, and then it’s time to make a decision to start the billing process or continue using your old email platform. (You can also get a good idea of how the Google product works by using the consumer version, but there is a difference. You miss out on the admin panel capabilities, plus you have to look at ads). Back to the trial: what happens when your trial ends and you don’t begin the billing process? You no longer have access to that account and if you’ve already tried to get back in, you’ve hit a wall. If you decide a couple months later that you do want to continue using that domain, how do you get it back? 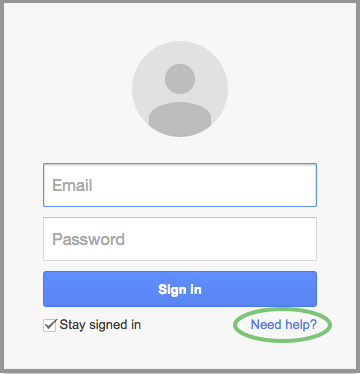 The directions in this post are not only useful for when you’re totally locked out and it seems there’s no way in, but it’s also the answer for admins if they forget their password. Keep in mind that this process has to be done by a super administrator. By following this link, you can generate a CNAME record and add it to your DNS Zone file. Once it’s added to your DNS, Google will verify that you have added the record and thus own the domain you are trying to access. It'll then let you reset your password and get into the account. Note: Adding a CNAME record will not affect mailflow or access to your website. If you are one of these users, please walk through the following directions. There is a screenshot to go along with each step, so this should be easy. 1. 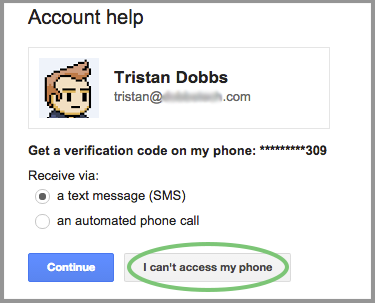 Attempt to log in as an admin for your domain that is using Google Apps at admin.google.com. 3. Click ‘I don't know my password’ and type in the email address of the primary administrator for that domain. 4. Click ‘I don't know’ underneath the password. Here, I'm using my personal domain as an example. 5. Click ‘I can't access my phone’. 6. Now click ‘Reset your administrator password by domain verification’. 8. Enter an email address that you can access. Google will send the correct information to this address after you verify your domain. Click ‘Continue with domain verification’. 9. On the final page (not pictured for security reasons), Google will provide you with clear instructions for adding a specific CNAME to your DNS. They will provide the CNAME value and also a link to click and verify. Lastly, click ‘I've completed the steps above, continue’. Need further assistance? Cloudbakers is more than able to take care of this task for the normal cost of support. All we need is access to the hosting service for the domain and we can have it done very quickly for you. Email the experts. Author Bio: Director of Technical Delivery, father, and superhero. 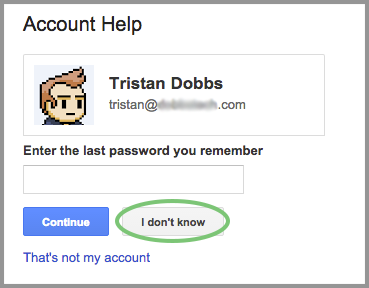 Tristan loves all things cloud, and especially admires Google. He works day in and day out to make sure our clients are getting the most quality service from Cloudbakers and are productive on G Suite.